In the office it’s always important to assess how much space you may need. The right amount space, especially in a new facility, can be very tricky. You don’t want too much space nor do you want to invest too much cash flow into purchasing furniture. You will want to develop reliable space in your office. The right office furniture can help you accomplish this goal of adequate spacing and functionality. 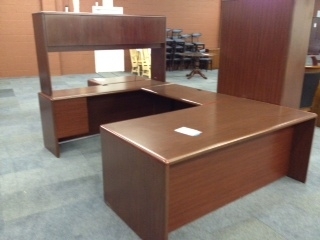 A very beneficial piece of office furniture is an executive desk. This desk can enhance the efficiency of any office space because it provides effective and specific workflow and functional organization. You will have file storage, space for your computer, a printer and more. Keeping your private office organized can improve your corporate culture and truly represent how your firm should be perceived in the marketplace to clients and potential employees. Improve your business management today with executive desks from Mark Downs Office Furniture. You’ll have plenty of room, plenty of storage and plenty of organization. This entry was posted on Friday, September 21st, 2012 at 8:37 pm. Both comments and pings are currently closed.